Why would anyone choose to lock themselves in a small room, knowing the only way out is to uncover clues, break codes, and solve puzzles until they uncover the key to the exit, and they’ve only got an hour to do it? I did my first escape game in Orlando a couple of years ago, and I’ve been hooked ever since. You get to play a real-life version of The DaVinci Code, a spy movie, and a mystery novel all rolled into one—how cool is that? I’ve done about five now, and they’ve all been great. Okay, okay, there was one in Virginia that wasn’t set up correctly and, as Joe puts it, it “broke my brain”—one of the clues was a clock that wasn’t set to the right time, so we couldn’t advance in the game. Talk about frustrating. Luckily, more and more escape rooms are popping up, so the memory of that one less fortunate experience is quickly fading. 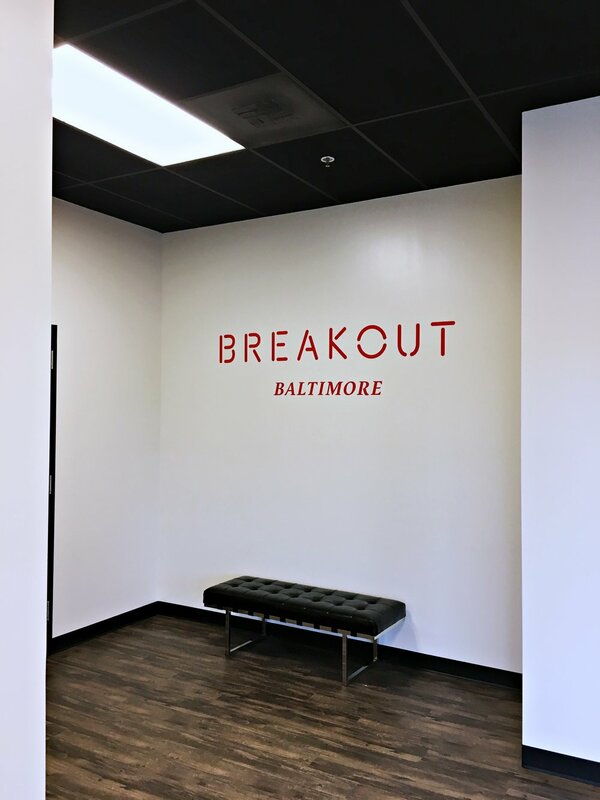 The one that just opened in Columbia (they’ve got a Timonium location, too) is called Breakout Games, and I’ve done enough escape games now that I feel qualified to declare that this one is legit. It’s part of a franchise, for one, so let’s face it, it’s got a bigger startup budget, and it shows, in both the setup and the game itself. Fresh paint, hardwood floors, and an incredibly minimalistic lobby that doesn’t give away any secrets. You’re kidnapped and find yourself handcuffed and blindfolded to your friends, and you have an hour to figure out how to escape before the kidnapper comes back. You’re a former art thief, and are hired to break into a thief’s home to recover some stolen artwork, just in time for the gallery to open in…you guessed it…an hour. You’re on a plane, and your flight is hijacked. You wake up to find yourself in the hijacker’s headquarters, handcuffed to your friends, and you’ve only got an hour to find your way out! The kidnapping and hostage ones are a bit scary for my taste—I like mystery and intrigue more than thrills and chills, but hey, whatever floats your boat. I correctly assumed I wasn’t allowed to take pictures of the interior of the game: No spoilers allowed! Everyone says escape games are great for team-building (and indeed, Breakout Games Columbia has already hosted plenty of corporate events), but recalling some of the people I’ve worked with in previous jobs, I definitely prefer playing with friends. But let’s face it, I love these things so much, you wouldn’t have to twist my arm too hard to get me to do it with co-workers. Assemble a good team. Build a group that will work together, preferably made up of people with different strengths. Critical thinkers, outside-the-box thinkers, dimensional thinkers, crossword enthusiasts, mystery lovers, etc. make for a great lineup. Good communication is a must. Leave the argumentative control freaks at home. Get a private room. The rooms at Breakout Games Columbia are designed for a max of 7 – 8 people, so if you don’t fill (or buy out) the room, there’s a chance you can get paired up with other people. I’ve heard horror stories of bad pairings, like a couple who got paired with a family that included two children. The parents didn’t let the couple participate, so their kids could have a chance to solve the puzzles. Not. Cool. Check Groupon and Living Social for deals on private games—we scored one for $99. Ask for hints, but not so many that it takes the challenge out of it. Like the rest of the escape rooms I’ve done, Breakout Games Columbia has video surveillance (they’re not about to lock people in a room for an hour and not supervise them). But unlike other games I’ve done, that give players a walkie-talkie or phone to communicate with the staff, Breakout Games Columbia has audio integrated into the room. So if you need a hint, you just call out to the heavens, and a majestic voice from above points you in the right direction. Our deity was named Steve. He did a great job of helping us out just enough to get us back on track when we’d come to an impasse. Thanks, Steve. Above all, have fun. At the end of the day, this is a game. An intense, thrill-packed, exciting, down-to-the-wire game, but a game nonetheless. If you can manage to really have fun with it, and maybe even laugh a few times, I promise you your brain will work better and you’ll be more likely to beat the clock and break out of there. What are you waiting for? Go get yourself locked in a room already!